I've found quite a few new things (new to me, anyway!) this month, so I thought I'd share them with you. I'm a big fan of Bahlsen products, particularly their fancy version of the jaffa cake and the Choco Leibniz biscuit. The chocolate juts over the edge of the biscuit, which allows you to nibble the chocolate off, before dunking the biscuit in coffee and sucking the melted chocolate off, then eating the biscuit. This is probably what marketing people call a multi-dimensional eating experience, I call it stringing out the eating of a biscuit. Anyway, the orange version has apparently been around for years, but I've only spotted it in UK supermarkets in recent months. Orange chocolate gets sickly very quickly, so the amount on these biscuits is perfect for a nice little hit. Choco Leibniz are quite often on special offer in Waitrose. Until this month, the only way I ate dates was by cooking them in porridge with sliced banana. Something about the way they look and feel had always put me off eating them as they come. As had the scene in Indiana Jones & The Temple of Doom, where the spy-monkey tries to kill Indy by poisoning his dates (or I guess, planting poisoned dates in the fruit bowl. Capuchin monkeys are clever, but I don't think they're capable of using a syringe to inject poison into fruit: are they?). But I was offered coffee, baklava and dates at a dinner I went to few weeks ago and I have been converted. Dates are now going to be kept as a regular fruit bowl item, so I have something wholesome on hand to finish off a meal. Ah, the joy of new discoveries via Twitter: it's always nice to find something with no calories that tastes delicious. 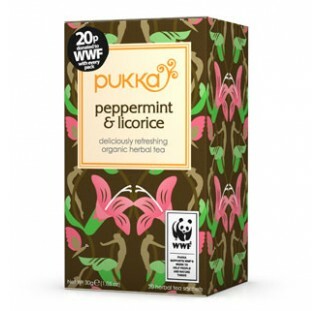 I'm getting on well with Pukka's Liquorice & Peppermint tea, which you can find in the supermarkets. This is the other dessert I brought to the barbecue I attended at the weekend. The host and his partner had promised to serve up a generous portion of pork ribs and one of the best antidotes I know for meat sweats is a dense, dark chocolate torte. I made a Bourbon chocolate tart (rather than a torte) last year, but the texture of the pastry was a distraction and the filling was bland. The bland filling was my fault, as I used a not-particularly-exciting chocolate (the brand rhymes with 'align'). If you're baking something where chocolate makes up more than a quarter of the total mass of the ingredients (see also; brownies), you want to use a chocolate that tastes good when you put a square of it in your mouth. I love dark chocolate from Madagascar, which as I learnt when I met the owner of Auberge du Chocolat, has fruity, summer berry notes, which I thought would sit well with the dried fruit and toffee notes in the Bourbon. I made this cake last night for a barbecue I'm attending today and I was certain that I'd posted about it before. But I've gone through my archives and can't see it, so here it is. A very buttery, fluffy vanilla cake, topped with a chewy salted almond praline. It's a good cake for picking at over the course of a week; the caramel coating seeps into the cake as the days pass, working to preserve it and to intensify the flavours. I first tested this cake on my work colleagues. I realised part-way through making it, that I didn't have the full weight of flaked almonds required for the caramel topping, so I topped them up with shredded coconut, this being an alternative topping suggested in the Scandilicious Baking book from which I took the recipe.